Being Frugal and Making It Work: Make Your Own Valentine's Kit: Review & Giveaway - 48 Hour Valentine's Day Giveaway! Make Your Own Valentine's Kit: Review & Giveaway - 48 Hour Valentine's Day Giveaway! 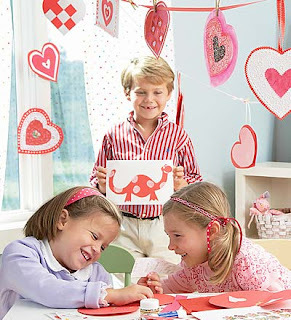 Do you have children that will be handing out Valentine's Day cards to their friends and classmates? I have always been a huge fan of homemade cards and gifts. I remember making them as a child and I remember how happy it made me to give the person a gift that I had made special just for them. Now, I get to watch that same excitement on my children's faces. Making gifts teaches my kids so many valuable lessons. The most important ones to me personally are the gift of giving and that you don't have to spend a lot of money to give a special and meaningful gift! I honestly think that the ones made from the heart are worth so much more. HearthSong offers their exclusive Valentine Making Kit. It’s a load of fun and brings out the creativity in kids allowing them to make handmade cards to give to friends, teachers and family members. This best-selling kit contains everything kids need to make dozens of valentines for schoolmates, teachers, friends and loved ones. For Valentine fun, add their Lots-of-Love Sticker Assortment (large, small and mini-sized stickers printed with flowers, hearts, alphabets, and more), and Decorating Chalks (24 brilliant rub-on colors) to your own handmade Valentine's Day cards for a special touch that's one-of-a-kind. I would love to win this for my kiddo. Seems like a lot of fun! I'd do this with my nephew. I would love making these with my Kindergartner son! I would like to win to make this with my grandson. I just wanted to you to know I stopped by....we don't need to win this one. I would love to do this with my daughter! I would do it with my four children! I would do these with my daughter! With the kids in my mother's Pre-k class! Would do this with my 3 year old Josh! I would like to win because these look like the perfect project to do together as a family! I'd make them with my family! I would make them with my niece and nephew! I'd love to win the kit and make cards with my grandsons. I'd like to win as my daughter wants to make her own Valentines this year & this would be fun to do with her! My five kids and I would make valentines for all the grandparents. Stop By And Enter My Current Giveaways! Crazy Parenting Tricks: What Works for You? Make it Personal - Send a Thank You Note! Lockers for Kids - A Fun Way to Stay Organized! Designer Perfume & Cologne at Discount Prices! FREE Mother's Day & Father's Day Gift Ideas! HOT New Fisher Price Coupons! Steel Buildings Make the Perfect Man Cave! Earn Money Online - Join Superpoints & WIN! My Guilty Pleasure: Stylish & Affordable Bedding! Google Page Rank has Updated! Super Bowl 2012 - Place Your Bets! St. Patrick's Day - Funny Irish T-shirts! Love Letter to My Husband, My Rock, My World!